So said Charles I in the immediate preamble to his losing his life at the executioner’s block outside the Banqueting House in Whitehall, a building his father commissioned and that he himself embellished with the help of Peter Paul Rubens. Seconds later it was all over, and the crowd let out a terrible moan, among their number both Samuel Pepys and John Evelyn, two young men destined for great things. 30 January 1649 remains one of the most significant dates in British history, which still resonates today. Most people who think about such things, consider themselves to be a Roundhead or a Cavalier. Both Charles and Cromwell are eminently hissable villains, depending on one’s point of view. But it was a sad day, no question, and even the little king’s detractors then and now cannot begrudge the bravery and dignity with which he met his fate. Contemporaries realised the enormity of the event, which had consequences for everybody, from the Royal family to the man in the street and for every stripe of religion, but in particular Jews (good) and Catholics (bad). The ramifications for our constitution can hardly be overstated. For Londoners, Charles still lives among us. His portraits are ubiquitous in our galleries. On the streets, we can admire his bust which sits above the entrance of Banqueting House and gaze up at the equestian statue by Hubert Le Sueur in Trafalgar Square. This is the oldest and first equestrian monument of a British monarch. 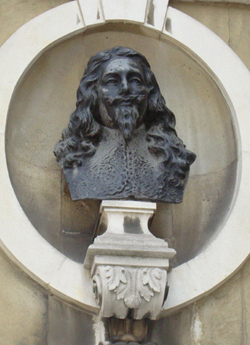 It was cast in the 1630s and positioned at Charing Cross. After the Civil War, the Parliamentarians ordered it destroyed. Disobeying this instruction, the man given the job instead buried it in his garden. After the Restoration, the statue was re-erected in 1675 in its original position on a plinth designed by Sir Christopher Wren and carved by the master sculptor Grinling Gibbons. It defiantly points down Whitehall, past the Banqueting House towards the Houses of Parliament. This is officially the point where all measurements from London are taken, so forever at the epicentre of his Realm, in death Charles has done rather well. 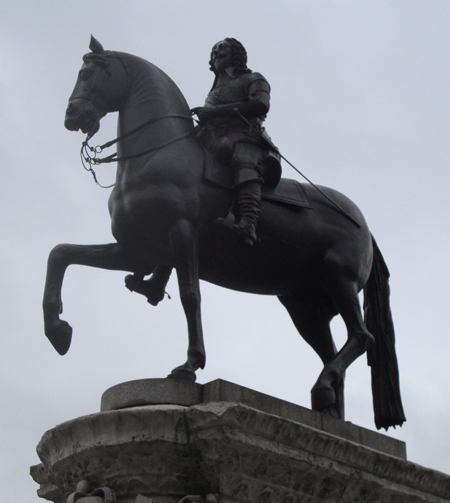 Equestrian statue of Charles I, Trafalgar Square. There is a good account of the execution here. If you are reading this in time, you might like to attend a commemoration of this event by the “Kings Army” who will be marching along the Mall from St James’s Palace on Sunday 30 January (tomorrow as I write). From 11 am. More information here. Are you able to go in the hall and see the paintings? I saw as boy in 54. Been back but it was closed. Yes you are. It’s a bit of a lottery though, because they frequently close the building for corporate shin-digs, businesses being able to stump up more wonga than humble tourists. One might expect less of this sort of thing in the years ahead, who knows. I went in last month and the Rubens ceiling is rather spendid, although I’m not a fan. I didn’t realise till quite recently that, unlike Michelangelo, he painted it in panels at his studio on the Continent and they were shipped over. I have no doubt as to which side I am on. I profoundly regret that the job started by Cromwell was not completed and that he could not, in the end, rid his mind of the notion that a monarch was necessary. In that, he betrayed the nation and all its generations since. As a result we still have that bunch of comic opera wastrels claiming to represent the nation and the people and complicating the political structure. I, on the other hand, would have long curly hair and a fancy hat if I could. Cromwell was a nasty piece of work, in my view, although that’s not really the point. The notion of Britain as a Republic with a retired politician as President is utterly abhorrent. The Royal Family are, at worst, harmless scroungers whereas politicians are – almost to a man – venal, self-serving criminals. Thats good, have not seen that in years.